CH76V7 Sidelight Leaded Beveled Glass Window Custom Glass Design. 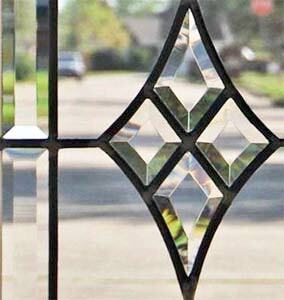 "CH76V7" LEADED BEVELED GLASS VERTICAL SIDELIGHT WINDOW CUSTOM AT GLASS BY DESIGN. Sidelight window was 12" x 36" with 3 clear CH76 bevel sets and a beveled border. The CH76 bevel set is 7" w x 9–3⁄8" h.
The ability to add or subtract bevel sets makes this a very flexible design. The only color in this window is what the camera saw through these clear glasses.